To improve performance and flexibility, without changing the ECU of your motorcycle. Plug & Play, reversible solution. 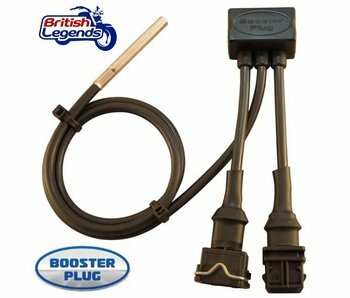 Kit for the removal of O2 / lambda sensors from the exhaust manifolds on Triumph motorcycles, while maintaining the engine management system. Kit including filter, motor oil and drain plug with copper seal + free chain grease spray! Pair of aluminum bar-end mirrors, satin black anodized finish. 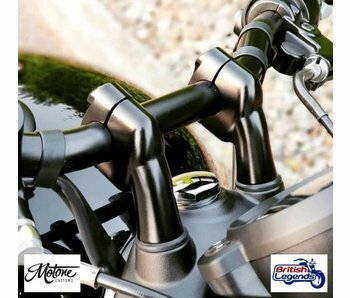 Direct fit on Triumph handlebars ! Pannier in strong waterproofed canvas, supplied as a complete kit (with patented fitting bar) ready to fit on the right or left (or both sides !). Tail tidy for a "no-fender" short rear on the new Triumph Twins. Complete kit with tail light, wiring loom and fixing kit. Provides a small storage space under the seat. Stainless steel de-cat x-pipe for the removal of the catalyst on Triumph Twin 900/1200, increased performance and better sound! 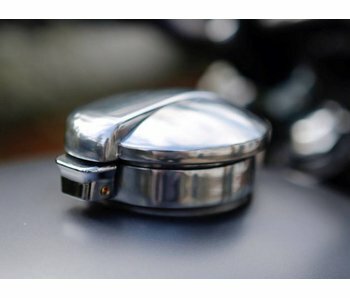 Complete kit to fit a center stand on bikes that do not have the factory/dealer option. Greatly facilitates parking and bike storage as well as routine procedures. 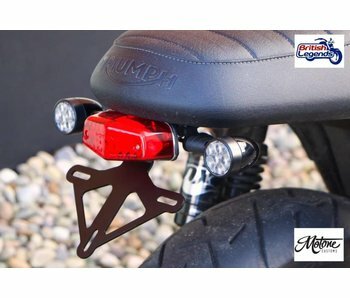 Saddlebag support rails for Triumph Bonneville, Thruxton, Street Twin and Street Cup. Compatible with luggage rack or passenger handle. Oil drain plug & seal for easy oil changes. Magnetized screw and copper gasket. Oil temperature gauge that replaces the oil filler cap. 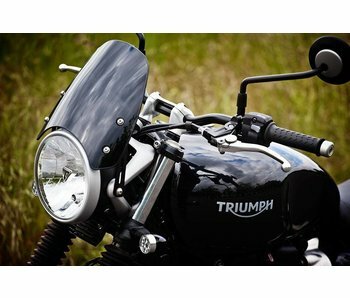 Fly-screen for Triumph Street Twin sold as a complete kit. DART brand, made in England. 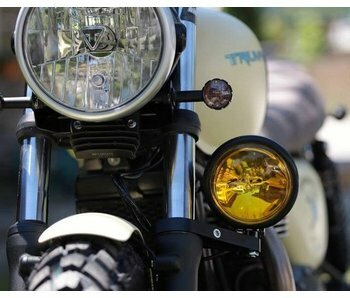 Complete kit for the installation of an additional headlight (white or yellow) on Triumph Twins. 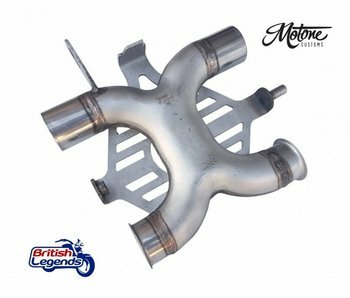 Stainless steel bypass pipe for the removal of the catalyst on Triumph Twin 900/1200, increased performance and better sound. Lifetime warranty! High-quality "Bullet" indicators milled from solid aluminum. Sold as a pair. 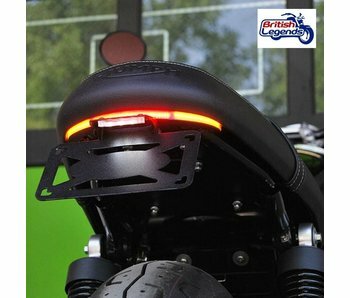 Pair of handlebar "Up & Over" risers, to bring the handlebar closer to the biker for greater comfort. Heavy-duty luggage carrier for all Triumph Twins since 2001, including a grab handle for the passenger. 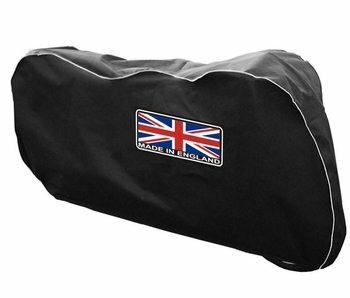 Ideal to fit a top-case or any luggage. 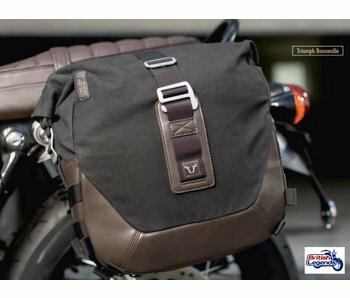 Synthetic leather saddlebags, good quality and looks for the price. Sold as a pair.